(CONGRATS TO MELISSA FOR HER 2014 and 2015 GRAMMY NOMINATIONS FOR MUSIC EDUCATOR OF THE YEAR!!!!!) 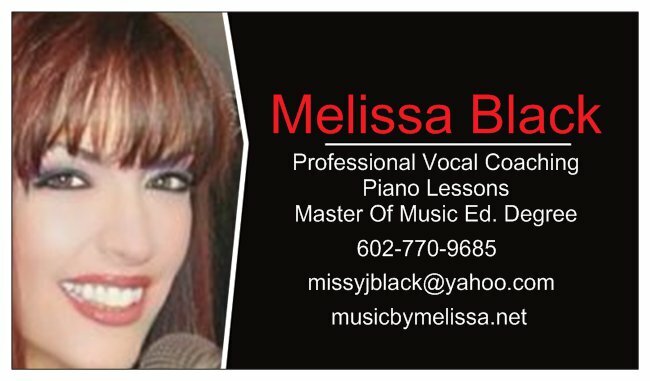 AND Melissa has been voted BEST VOICE TEACHER in the greater Phoenix area! She is the ONLY teacher that plays for all of her lessons - plays all of the music BY EAR and not only in the original key- but ANY KEY you need and BY EAR! ATTENTION - ALL SINGERS WANTING TO DO "The Voice" AUDITIONS! They have lowered the auditioning age to THIRTEEN!!!! WOW!!!! PLEASE - watch and learn from that show. Singers are doing all genre's - all types of music - doing songs from bands and artists that were popular even before these singers were born! AND they do them nothing like the original. They "make them their own". Start listening to songs from the 60's - 70's - 80's - alternative and grundge from the 90's - learn how to sing todays music in a different style than the original artists. And knowing how to play piano and/or guitar is very important to your musicality. AND whatever you do - don't wait until the last minute to get coaching before and audition - start now and get yourself in shape for the big stage that you might just be performing on soon!! 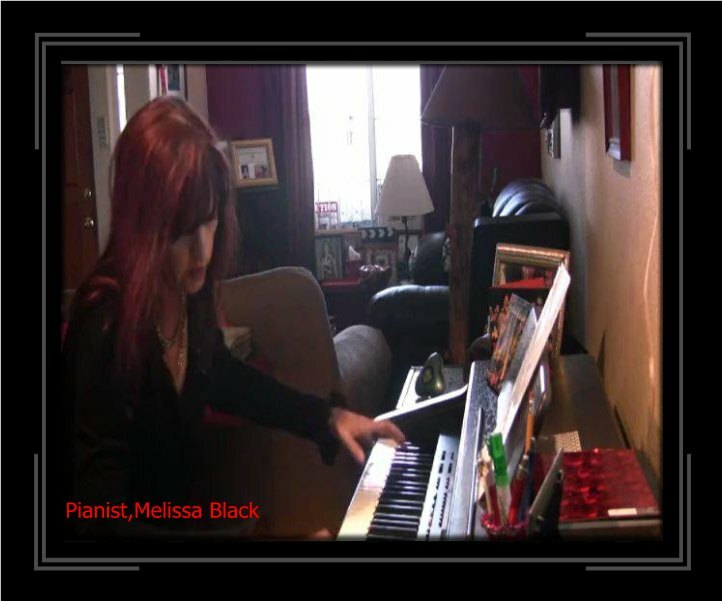 EMAIL MELISSA NOW AT MISSYJBLACK@YAHOO.COM! NOBODY IS BETTER AT WHAT THEY DO THAN MELISSA! MASTERS DEGREE - VOCAL MUSIC EDUCATION - UNIVERSITY OF CENTRAL OK.
FOR THOSE WHO WISH TO RECORD THEIR LESSONS!!!!! I have a STATE OF THE ART brand new Yamaha Clavinova Digital Piano that has USB recording capabilities!! If you want a recording of any of your lessons - Bring with you an "unused" USB JUMP DRIVE. I ALSO HAVE SOME FOR YOU ALL TO PURCHASE for 10.00 CASH!!! Consistency is very important in the study of music. Regular attendance at your lessons and practicing between lessons is crucial to your development as an artist. I require 12-hours’ notice to cancel lessons. If less than 12-hours’ notice is provided, students will be charged for the missed lesson. This is especially true for those of you who only come every OTHER week. Those of you who choose to to every OTHER week - please mark your calenders so you will remember. If you miss more than one lesson without a text or email - i will take you off of the regular schedule to make room for others. You are still welcome back,however and must bring money for the missed lessons. I also expect ALL of my singers to do warm-ups each and every day! For classical and broadway singers - a minium of 30 mins per day and for my rock,pop and country singers - a minium of 15 mins per day. If you all want to achieve vocal mastery - you must warm up the voice using the correct technique every day. * If you do need to cancel, please contact me as soon as possible. I check voice mails, emails and texts regularly throughout the day. You will know your lesson is "cancelled" when I have replied. Please remember that this is my personal business and I am reserving your spot. SINGERS - ASK YOURSELVES THESE QUESTIONS! Can you sing in tune well? Can you sing rock,pop,country and every other style? Can you read music and sing it without accompaniment? Do you understand musical terms? Can you hear and identify chords? Can you arrange vocal harmony? Can you sing and look professional on stage? Can you record effectively and artistically in a studio? Can you play piano enough to play and harmonize a tune? It also does NOT HURT to pick up the guitar and learn to play it too AND play WHILE YOU SING. If you cannot play AND sing at the same time - you really will have a harder time making it in the music business. AND you need to be able to play by EAR - don't use "guitar chords and tabs" as a crutch. Can you write lyrics and music (songs)? In other words - you better be able to write you own music - and that means lyrics AND music - not just one or the other. Can you function successfully in the business world? In other words - can you handle your own business affairs and not completely depend on someone else? Can you keep a group together and effectively lead it? Can you overcome your fears and pursue your goals?